If somebody had taken a poll in the Battle of the Bulge, I dare say people would have said, wow, my goodness, what are we doing here? 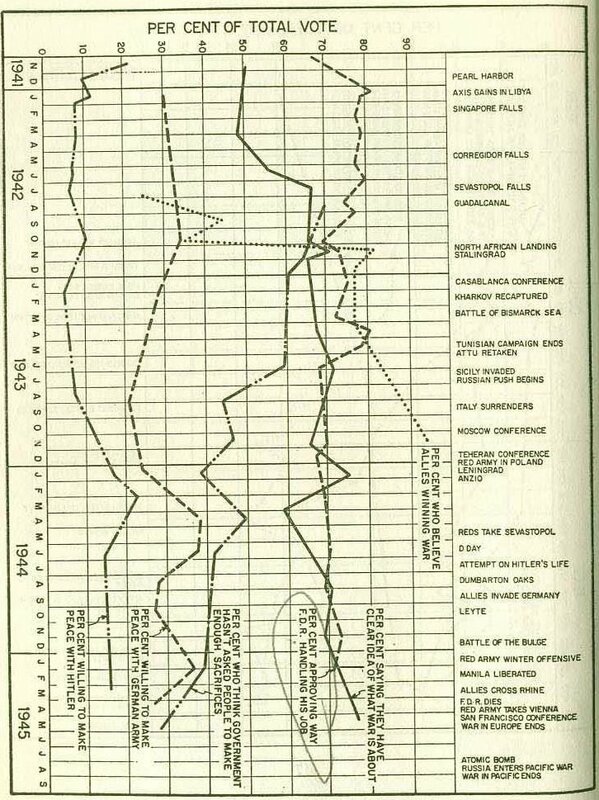 As you can see, there was no downtick in public support for the war around the time of the Battle of the Bulge. 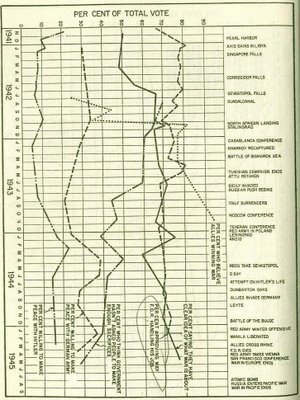 Approval for President Roosevelt's conduct of the war continued at around 70% where it had been for years. The number of people who said they had a clear idea of what the war was about was at about the same level and appears to have been rising. One of those questions is "percent who think the government hasnt asked people to make enough sacrifices." I'd like to see the responses to that question today. Jason asks a fair question there. However, you must admit that FDR had virtual universal support from the media at that time. There weren't the instantaneous images being broadcast to TV sets and the Internet in every home, and reporters and even Hollywood were on the victory bandwagon. They play a huge role in framing public opinion. Also, bad news was frequently censored. It still is in military circles, but not to the degree of back then. FDR had virtual universal support from the media at that time. Think back to the begining of the invasion of Iraq. You think Bush was lacking in media support? The problem is he squandered it - and public support by underfunding, undermanning, and under planning the occupation. it is no tthe media, it is the incompetence. For Bush, the war was all about winning the mid-terms and it worked. He won the mid-terms. Why Don't I Feel Safer?